Not everyone is a marketing expert, and even those who claim to be still have a lot to learn. As a gym or studio owner, putting together a marketing plan and detailing out your entire year probably isn’t your #1 priority going into a busy new year. From social media, to blogging, to campaigns you will want to run around each holiday, it can get extremely overwhelming. We get it. So, we have broken down 6 ways that make it easier for you to create a marketing plan and actually stick to it. When creating any type of plan for an entire year, flexibility is key. You can’t foresee what new or exciting thing might come along 8 months from now, so keep your plan flexible and easy to change. We suggest that you take the major holidays and start thinking about what you want your promotions to be so that you can be creative and not reuse your campaigns. Having your Memorial Day, July 4th, Halloween, Thanksgiving, Holidays, and New Years campaigns planned out allows you to really put time and thought into each one, instead of throwing something together the week before. This is especially helpful when you are planning events every month, you can ensure you have the time to market the event and not overlap. As for the weeks and months in-between the holidays and events, have a basic plan or outline of what each week looks like. If you want a blog post every two weeks, or a social media post everyday, write out that you want to see a post, but you don’t have to have the content just yet. Before the start of the month it’s a good idea to go through and start planning out specific content, but before then it’s probably just going to change. Just because you are being flexible doesn’t mean that you can’t have specific goals and added details to your plan. So that you have something to work towards, set quarterly (or monthly) lead and membership goals. By having that metric set and communicated, it gives you and your sales team something to work towards everyday. You can also be specific in your plan. Like we mentioned, you can break down your plan by content type, such as a blog or social media post. If you have certain events or promotions that you can already plan for, write them down. The more specific you are the more likely you are to stick to the plan, but as we mentioned, leave room for changes. This is one of the most important aspects of creating a plan, actually having time to brainstorm beforehand. When it’s December of 2017 and you are already thinking of your plan for July 4th, 2018, you allow yourself and your team to come up with ideas that are out-of-the box and eye-catching. When you are trying to plan 3 days before, you’re more likely to just pick a promotion you have used before and go with it. Do some research on events, social media best practices, promotions, and more to really make your marketing plan worthwhile. You never know, this could be the one aspect of your business that is holding you back from the leads you are missing out on. This is also a great time to get your team involved, whether it’s a marketing team or a couple of front desk employees, everyone is going to have some unique ideas. Include everyone in the brainstorming of promotions or events and watch the creativity flow! Like the idea but not sure where to put all this planning? 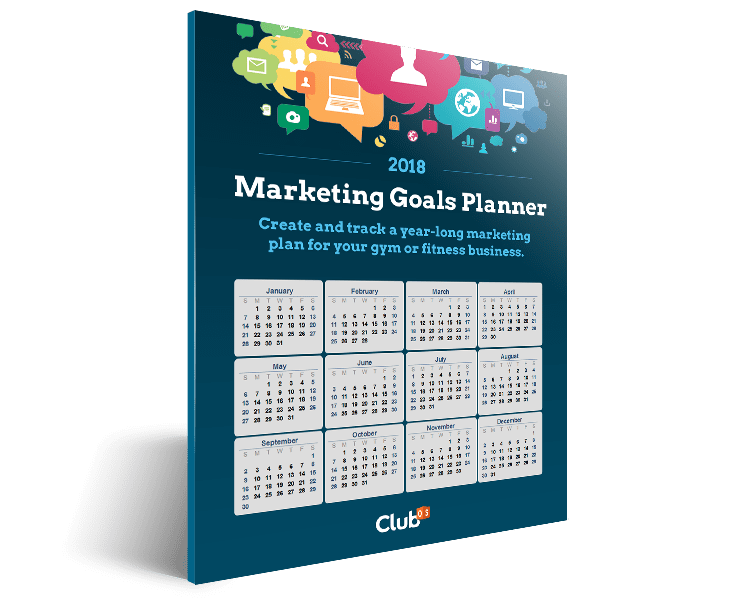 Download our 2018 Marketing Planner here and get started. It’s necessary to have a place where you plan and track how much you are spending on each promotion, event, and marketing campaign. Using a plan to look at your entire year allows you to put more budget towards busy times, and less budget towards times where it wouldn’t be worth it. For example, a pre-summer event or New Years event would be places where your budget could give you more bang for your buck. During slower months, it’s a good idea to be smarter about your budget to ensure you aren’t overspending with very little payoff. Break down your budget by each campaign and track the success. This will help you decide if the money you spent was worth it, or if it wasn’t as successful, this will also help you figure out your cost of acquisition. To find this number, you would define the cost you spent on the specific campaign or event, and divide that by the number of new customers. For example, if you spent $300 on a marketing event, and you got 3 customers signed up that day, your cost of acquisition would be $100 per customer. Goals are just ideas until you get them on paper (or on a computer in our case). Once you write goals down and create an action plan, you see a significant increase in the motivation to reach your goals. When you have a plan for the entire year and goals set for the year, you are able to cover every aspect of your business. If you have sales goals, marketing goals, or retention goals, you should write out a plan that will help you reach those goals. Of course, as we mentioned, this plan can be flexible, but it allows you to create a starting point. When you write down your goals, it keeps you and your team accountable. Accountable to yourself and anyone else who is directly affected by the sales, marketing, or retention of your business. All of your planning sets you up for success, and sometimes that success happens, sometimes it doesn’t, and that is okay, as long as you learn from it. Tracking the results from each of your campaigns means you can go back and decide if it worked, if you should duplicate it, or if it was a failure. When looking at your results for a marketing campaign for example, you should look at spend, time spent on the project, the number of people who were touched by the campaign (saw it, clicked, visited, attended, etc. ), and the number of actual sales per that campaign. Compare those numbers to your goals, and decide your success rate. Keep your results in an easy to reach place so that when you are planning for future months or years, you can go back and see what worked best for your gym or studio. Focusing on your business in 2018 is going to make your sales and marketing goals bigger and better than ever before. Start your 2018 right by downloading our 2018 Marketing Planner HERE.